Following on from the difficulties caused this morning by the snow, the children were really able to enjoy themselves at playtime. The children returned to class with rosy cheeks and beaming smiles, whilst the staff licked their wounds and removed snow from their ears! It looks like the snow may linger for some time, so stay prepared! From the way how it has been described to me the staff were no match for the kids! 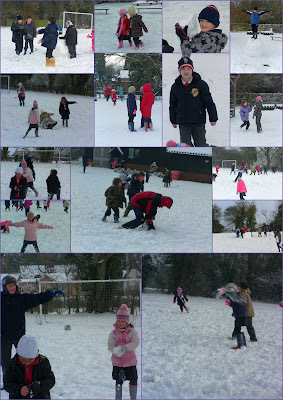 It is great to know that the kids are allowed out to enjoy themselves and not kept inside.